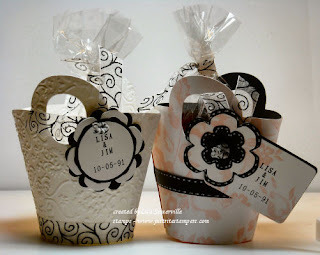 The new Baskets & Blooms die is perfect for any type of shower favors, or just a cute little gift giving basket. On both of my samples I used my JustRite Small Letter Set to add personalization to my tags. On my black & white sample - I ran my card stock through my cuttlebug embossing folder then cut it with my die and assembled, adding the tags and ribbon. The other basket is cut from the Bella Rose Designer Series Paper, since the paper is double sided, I lined the inside with a black card stock cut from the same die - to stay with the black and pink theme. The flowers are also part of the die, and can be used with the die as a decoration - and also look great on cards! Baskets & Blooms is one of SU's exclusive dies made for use with the Big Shot - this die as well as many others will be available for purchase next week - watch for information to be posted on my blog on Monday. These are just Gorgeous. Love the black with the light color. Really makes them very elegant looking.